2019 Accomplishments and fundraisers - January through December 2019. January 2019- Received the fourth quarter of 2018 donation from the Carrollton F.O. Eagles #2185 in the amount of $12,467.39. Their generous donation will go towards the ceiling grid installed in January 2019, and also towards the installation of all LED lighting fixtures throughout the shelter. To be started January 28th, 2019. February 2019- Received a grant from the Stark Community Foundation- $10,190.00 - from the Douglas L. Houck Charitable Fund towards the LED lights throughout the shelter. 2018 Accomplishments and fundraisers - January through December 2018. January 10th, 2018 - Received the fourth quarter donation from the Fraternity of Eagles #2815, Carrollton, Ohio in the amount of $6,093.38 which will go towards the stud wall construction. March 2018- Received a grant from Stark Community Foundation - $10,210.00 - from the Douglas L. Houck Charitable Fund towards the Electrical installation. March 2018 - Wells Fargo $22,098.28 check - Barry Busse Life Insurance Policy disbursement towards the Electrical installation. April 2018 - Received a $5,000.00 donation from the First Presbyterian Church of Waynesburg, Ohio towards the drywall installation. May 15th, 2018 - Received a donation of $2,932.80 in honor of J.Z. Wireman-U.S. Army from Ken Young, POA and Citizens Bank for charity disbursements. May 18th, 2018 - Received a $1,000.00 donation from an anonymous donor. July 5th, 2018- Received a grant from the Giving Well Family Foundation for $2,270.00 to cover the cost of the installation of the framing and door and glass panels for the foyer entrance. July 11, 2018 - Received the second quarterly donation from the Fraternity Order of Eagles #2185 of Carrollton, Ohio in the amount of $8,540.13. September 23rd, 2018 - Public Viewing Day tours at the animal shelter. October 2018 - Received the 3rd. quarterly donation from the Fraternity Order of Eagle's #2185 - Carrollton, Ohio in the amount of $8,468.53. January 2017 - Received a check from the Fraternity of Eagles #2185 in the amount of $2,915.18. This was the last check of the quarterly donations from them. January 2017 - Received two check for $1,000.00 from anonymous donors- Total $2000.00. March 2017 - Received a $10,603.00 Charitable Trust Gift Grant from the Douglas L. Houck Foundation, and this generous gift will be used towards the cement installation in the spring of 2017. April 8th, 2017 - Held our annual Spaghetti Dinner at the Minerva Senior Center-great turnout! April 8th, 2017 - Received a donation of $2,281.94 from the Fraternity Order of Eagle's #2185 as the fist quarterly donation for the year of 2017. We thank them for their continued support and generosity! May 21, 2017 - Accepted the bid by Richardson Electric - Carrollton for the Electrical installation throughout the shelter at a cost of $89,400.00. July 5th. - Received a$1,000.00 grant The John H. & Evelyn L. Ashton Preservation Association, Inc.
July 12th. - Received a $2,000.00 donation from an anonymous member in memory of her cat. July 18th. - Received a donation from the Fraternity Order of Eagles for $1,873.63 of Carrollton, Ohio as the second quarterly donation. We thank them for their continue support and generosity! July 19, 20, 21 - 2017 - Richmond Concrete of Carrollton, Ohio installed the 6" - 8" of cement throughout the animal shelter. October 5, 2017 - Received the third quarterly donation from the Fraternity Order of Eagles #2815 in the amount of: $2,916.86. We thank them for their donation and this will be applied to the steel ceiling in the kennel area to be done soon. December 18th. 2017- Received a generous donation from Rick & Carol Hannon in the amount of $25,000.00 towards our interior construction. December 22nd, 2017 - Received a generous donation from an anonymous donor in the amount of $3,000.00 towards our interior construction. December 22nd, 2017 - Received a generous donation from Rick & Carol Smith in memory of their beloved companion dog, "Rambo" in the amount of $250.00 towards our interior construction. January 2016 - Received a $10,385.00 Charitable Trust Gift Grant from the Douglas L. Houck Foundation towards our no-kill animal shelter construction and this generous grant was used towards the rough-in plumbing which was done in June & July of 2016. April 2nd, 2016 - Annual Spaghetti Dinner - Minerva Senior Center. April 18th, 2016 - Received a check for $2,000.00 from an anonymous donor. $1,000.00 is for the rough-in plumbing, and the other $1,000.00 is for the cement installation. April 20th, 2016 - The CCAPL President spoke to the attendees at the Carrollton Friendship Center on the CCAPL. Saturday, April 30th. Hot dog stand & pet products sales & bake sale - Dollar General Market - Carrollton. May 7th, - Hot dog stand & pet products sales & bake sale - Dollar General Market-Carrollton. May 14th - Membership Drive & Pet Products, cookbooks & T-shirt sales- Lake Mohawk annual yard sale. May 28 - 30, 2016 - Three day rummage sale at Garner's Auction Barn - Carrollton. June 11th, - Hot dog stand & pet products sales & bake sale - Dollar General Market- Carrollton. June 18th. - People and Critter Strut - C.C. Fairgrounds, Carrollton. July 7th. 2016. The CCAPL received $3,074.81- the 2nd. donation from the Fraternity Order of Eagles # #2185 of Carrollton, Ohio. July 11th, 2016- The CCAPL received a check for $5,000.00 from the C.C. Constructors, LLC Union Craft Workers and the Bechtel Power Corporation working to build the power plant on St. Rt. 9 - Carrollton, Ohio. This generous donation was applied to the rough-in plumbing done in June and July of 2016. July 30th - Received a check for $1,000.00 from J. Hawk Water Service, LLC - Malvern Ohio. This generous donation was applied to the rough-in plumbing done in June and July of 2016. September 30th. - Received the third donation from the Fraternal Order of Eagles # 2185 of Carrollton, Ohio in the amount of $2,454.11. December 10th. and Dec. 17th. - Held the "Photos with Santa" at Tractor Supply Center in Carrollton, Ohio. December 2016: Received a generous donation of $25,000.00 from Richard and Carol Hannon. This donation will be applied to the cement installation in the spring of 2017. December 2016: Received a generous donation of $3,000.00 from "anonymous donors." This will be applied to the cement installation in the spring of 2017. December 2016: Received a grant of $2,000.00 from the Giving Well Family Foundation. December 2016: Received a donation of $500.00 from anonymous members. January 2015 - Matched the Giving Well Family Foundation grant of $7,500.00 from numerous CCAPL members, anonymous donors, friends of the CCAPL, and the general public. 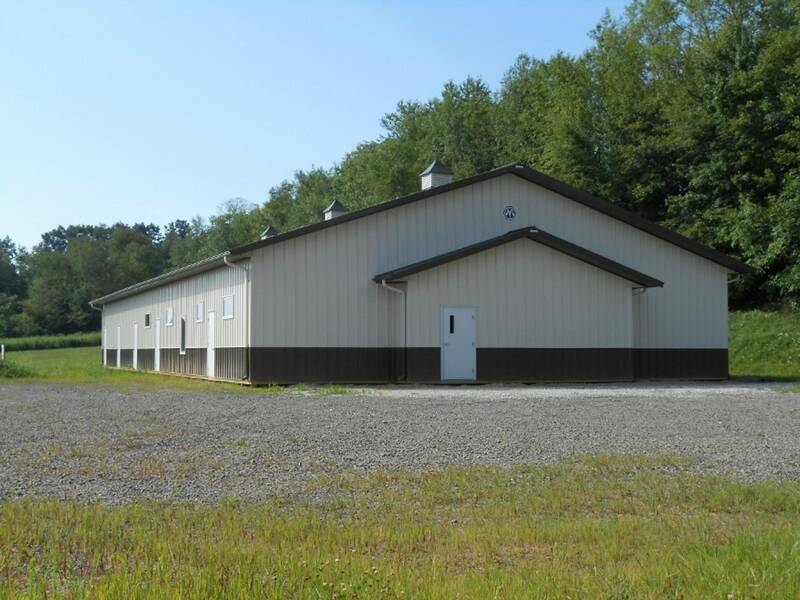 January 2015 - Received a $10,313.00 Charitable Trust Gift (grant) from the Douglas L. Houck Foundation toward our no-kill animal shelter construction and this generous donation was used to erect the no-kill animal shelter building. April 9, 2015- The Carroll County Animal Protection League has received the third monetary grant from the John H. & Evelyn L. Ashton Preservation Association, Inc. of Carrollton, Ohio. Their commitment to us is $4,000.00 each year from 2013 to 2015. We thank the John H. & Evelyn L. Ashton Preservation Association, Inc. for their generosity and support to us. This monetary donation grant will be used in the no-kill animal shelter construction. May 31st, 2015 - Ground-breaking ceremony on our land. June 3rd. 2015 - Our animal shelter building arrived! June 4th. 2015 - Animal shelter construction started! Bought and paid for - $129,500.00, plus $22,500.00 for the mechanical plans. June 23rd. 2015 - The animal shelter building shell was completed! November 20th, and 21st. -Consumer's National Bank - Carrollton - Membership drive, bake sale and pet products sales. December 7th, 2015- Received a $25,000.00 donation from the Richard and Carol Hannon Foundation for future construction. November 12, 2014 - The President spoke to Mrs. Tiffany Faulkner's Enriched Language Arts Class (11th grade), Carrollton High School. As a class project, the students presented their posters, flyers, letters, fund-raising ideas, and a video to the President to help the CCAPL raise money for our no-kill animal shelter construction. December 19th. - President spoke to the Carrollton Middle School on the CCAPL, "Stop-Plant-Fold" safety, pet care, spaying and neutering, and much more. Accompanied by Nancy Cazan and her dog, Skyler." May 2013- John H. and Evelyn L. Ashton Preservation Association, Inc. - Carrollton, Ohio plus 2014, & 2015 - $4,000.00 each year. May 28 - Augusta Elementary School - Ray and Sharon Morgenstern and their Golden Retriever dogs "Buster" and "Minnie" presented to the children at 1 p.m. on the CCAPL. May 29 - Carrollton Middle School - Ray and Sharon Morgenstern and their Golden Retriever dogs "Buster" and "Minnie" presented to the children at 9 a.m. on the CCAPL. April 7 - Eat Stand/Bake Sale - Dollar General Market - Carrollton - 10 a.m. to 3 p.m.
June 30 - Eat Stand/Bake Sale - Dollar General Market - Carrollton - 10 a.m. to 3 p.m.
August 11 - Eat Stand/Bake Sale - Dollar General Market - Carrollton - 10 a.m. to 3 p.m.
September 1st - Eat Stand/Bake Sale - Dollar General Market - Canton Rd. - Carrollton - 10 a.m. to 3 p.m.
September 16 - Fall Festival - Lake Mohawk - Malvern - 10 a.m. to 5 p.m.
September 22 - Eat Stand/Bake Sale - Dollar General Market - Canton Rd. - Carrollton - 10 a.m. to 3 p.m.
October 13 - Eat Stand/Bake Sale - Dollar General Market - Canton Rd. - Carrollton - 10 a.m. to 3 p.m.
October 20 - Benefit Dinner & Silent Auction - Minerva Community Hall - Minerva - 4:45 p.m. - 7 p.m.
2010 CCAPL Accomplishments and updates: January 1st. through December 2010 -see below. October 2010 payment to Shecklers Excavating, Inc. for two-way driveway: $16,700.32. December 2010 current loan balance: $22,422.65. Our montly payments are $350.00 which our fund-raisers are applied to including our "Pennies for Paws" donation cans placed at area businesses. Total assets including cash as of December 31st, 2009: $115,014. (We paid $2250.00 to Willoughby & Associates for an audit in April 2010). May 14th. Dellroy Elementary School - The President and Ray Morgenstern and his Golden Retriever "Buster"
June 1st. Carrollton Bell-Herron Middle School - The President and Ray Morgenstern and his Golden Retriever "Buster"
May 29th. & 30th. Rummage Sale - Garner?s Carr. 2009 Accomplishments: (Note: We have raised: $23,067.39 from January 1st, to December 1st. 2009.) Over $8,000.00 was paid to Hettler Engineering to handle EPA & ODOT requirements and site plans. As of December 1st. 2009, the CCAPL has raised through fund-raisers, donations and grants, a total of $95,607.69. Although we do not have the entire amount because we put a down payment on the land we purchased, paid for the preliminary shelter plans, paid Hettler Engineering for site plan drawings, paid for the installation of the two-way driveway, and insurance for property. Note: So many of our fund-raising expenses were covered by members! 2009 - Speaking engagements by the President, Vice-President, Amy Tripp, and CCAPL friend, Jennifer Walsh and her great dog "Buddy." September 14th, 2009 - President spoke to the Carroll County Retired Employees luncheon. Sepember 5th - Golden Age Retreat - Open House & Cruise In - Kensington Rd. Carrollton, Ohio- Membership Drive and Pet Products Sales. September 20th. - "Mud-Bog-Fest" - 4267 Canton Rd. Carrollton, Oh. - Don & Josie Kolm farm - Hot dog stand. On-going "Pennies for Paws" Campaign. (Donation cans placed at local businesses throughout Carroll County since February 2007- raised over $2,935.62 to-date). Rib?s Burn-Off - Carroll County . Fairgrounds - membership drive and sold re-sale items. Donated 19 pet oxygen masks to all Carroll County Fire Departments & C.C. Sheriff?s Dept. (All was paid for by members and friends for a total cost of $1,080.00). Helping the environment: We take in used ink cartridges and turn them into Staples for recycling and monetary value. Re-sale items: Fire Emergency Signs for pets inside a home or building. John Deere items: leashes, collars, bandanas, I.D. tags, Patriotic bandanas, lint rollers, educational books on pets and fitness, catnip toys and more.